Greg Morton Pigs Out @ Pig In, Pig Out! Whenever I travel to a new town, one of my favourite hobbies is to check out the local BBQ scene. Friday afternoon after my appearance at 107.3 THE BREW, I’m picked up and taken to a place where they serve the best BBQ in the United States. A pretty bold statement made by my Attorney friend, Danny Saville, but I am up for the taste test. Danny, leads me through the back door, past the cashier and into the kitchen of a tiny strip mall, in an industrial part of Wichita. It’s a relaxed, fun atmosphere that reminds me of a family kitchen. The faces of the staff beam with the same personal pride of a new parent, outside the delivery room . After a few quick introductions, I’m asked a question that completely throws me, “Do you like Salmon?” . Before I can think of protesting, a lemony, peppery, juicy piece of pink flesh is caressing my tongue. Delicious, I exclaim! Perfect if I’m observing Lent, but I’m here for BBQ! I’m here for ribs! One of the chefs offers me a rib as if to expect my next question. I quickly gnaw the flesh off the bone. It is perfectly cooked and well seasoned. Wow! This doesn’t need any sauce. It’s just great on its own. I’m told it’s all in the rub. A rub that has garnered so much praise and is responsible for the hundreds of 1st place ribbons that litter the walls of this establishment. As I sample the brisket, turkey, links and pulled pork my emotions range from complete euphoria to flame broiled anger. I feel duped by those other BBQ franchises masquerading as authentic BBQ. Sauce? We don’t need no stinking sauce. Sauce can mask the flavour of a truly good BBQ. 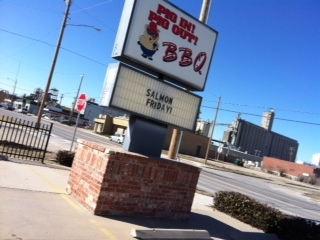 Next time you swing through Kansas, stop by Pig in, Pig Out, on a Friday afternoon. You might see a famous comedian like Rob Schneider sitting next to you. That is… if you’re not too busy burying your face in the best BBQ you’ve ever tasted.